** This is a high demand item so I ask those interested not to waste time on placing their orders. Your emails arrived on 06-Jan. Sometimes I can take 4-5 days to respond, do not worry. This week I'm suffering from severe back pain. Strychos is practically impossible for me to collect again, I only know one plant and it is located far from where I live. I will hardly visit the place again. Plant produces abundantly, today it has 6 bunches (1 bunch of ripe fruits, 4 bunches of immature fruits in different stages of development and 1 bunch of flowers. Take a look on the video, this is really one of my favorite fruits. Tropical Fruit Buy, Sell & Trade / Re: Posting prices from Brazil to abroad. Paypal had a small reduction on the percentage of their fees. Plinia edulis (reddish bark) available again. I was able to collect only 50 seeds at this year. Grayish bark cambucá are still imature, I think they'll be ready in two weeks. Thank you for the feedback mfysal. Since September, customs are no longer restricted, packages with large seeds are passing smoothly. Last year I got Brazil nuts directly from the Amazon region to produce my seedlings and had success with the germinations. So this year I'm pretty sure about the quality of my supplier and also the procedure for germination. I intend to offer this year again and would like to know who are the people interested in this species. I am quite confident that everyone will be able to produce their seedlings if they follow my recommendations. Those who are interested, please send inbox or email messages. Price will be the same from the last year. "Kingdom is a late variety (ready between late October and late November in the northern hemisphere) with a prominently large size (600 grams on average) and excellent red colouring both internally and externally. Its flavour has a sour touch that makes it very refreshing and has generated a lot of positive feedback from consumers. Additionally, the Kingdom does not have an excessively hard inner seed, which makes it stand out from other late varieties. It is highly productive, usually reaching around 40 tonnes per hectare, and is highly resistant to cracking"
I had the opportunity to get seeds of this rare and critically endangered (CR) species, so I'm making available for sale a portion of the lot. I'll get the orders this week and post the packages next week. Thanks for the feedback and support, Bestin and Satha. Fingers crossed for you plants. Best wishes. Customs inspections in Brazil has been stricter since March 2018, so at this moment I'm just sending tiny seeds. For better organization, in the first message of this thread I put two lists (available and out of stock). Many colleagues have asked me for seeds of this wood species. I have been able to collect so I would like to test if brazilian customs is relaxed again with these seeds. Pictures of seedlings are from my archives. The seeds are fresh, collected on 10-october. Acnistus arborescens also available again. Taste sweet, I have this plant cultivated in a 2 gallon bag. 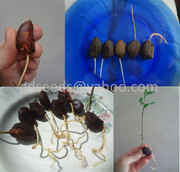 20 seeds (usd 15) + shipment registered mail (usd 7) or not registered (usd 4). Very small seed so it's possible to send it in envelope as paper letter. It's very grateful when a friend send pictures of plants originated from my seeds. I would like to share with you. Annona coriacea and Annona salzmannii growing very happy in USA. I would like to ask those friends who bought seeds with me to share pictures of their plants too. Thanks in advance. Oh, very fast using EMS mail. Good luck on germinations and thanks for the feedback!